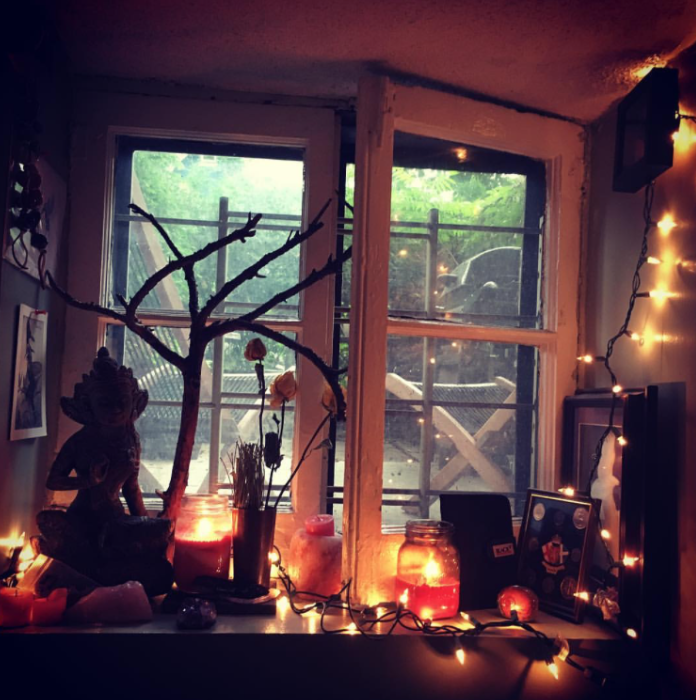 Dayle Mcleod's magical altar space. I want one. Remember when ‘The Secret’ came out and ‘The Law of Attraction’ was exposed? Every girl I knew (myself included) created a vision-board collage with image clippings from newspapers and magazines representing the life that we envisioned for ourselves in the future. On mine was a picture of a big house in the country, along with a flat in Manhattan; there were photos of the 1970’s white Dodge Challenger that I wanted, a picture of Leonardo DiCaprio, an Oscar. What can I say? I was young and in theatre school hoping for a career in the movies. The Altar is the necessary evolution of the vision board that shifts ambition from materiality to spirituality: from material desires that feed the ego (the perfected conceptual version of yourself that doesn't really exist) to desires for the gifts of spirit; such as patience, love, acceptance, healing and strength. These gifts of spirit are our natural birthright as human beings, and claiming them for ourselves in partnership with spirit is an empowering way to take control of your life. Think of these virtues like super-powers for human living- for example, how much patience, love and forgiveness do you think a real-life super hero like Nelson Mandela possessed? Could anyone ever take that away from him? No. Gifts of spirit are permanent and real and nothing can threaten them, unlike gifts of materiality. The Altar is a personal creative space that you keep in your home to remind yourself of the spiritual qualities you want to focus on nurturing in your life. Are you holding a grudge against someone who hurt you? Do you have a broken heart that is keeping you from giving love to another or to yourself? Need to heal your relationship to yourself and your body? Struggling with attachment to control of outer circumstances? Cant let go? Put it all on your altar to be altered by spirit. Find a space inside or outside your home where you can place physical objects that represent what you are letting go of, or opening up to receiving. Could be a table, a desk, a place on the book shelf, a windowsill, a shelf. Anything really. Give yourself permission to be creative. You might chose to place a statue of a deity that helps make you feel connected to what you want to create in your life. You might chose to use colors that correspond to the energetic Chakra system in the body. If grounding and stability is an issue for you, you will want to use the color red, and place earthy objects on your altar like sticks, pinecones or flowers. Maybe you want to heal the relationship with a family member so you place a picture of them on the altar. Maybe you are having issues with money so you place your check book on the altar. It will be an individual expression of your own life, so the possibilities are endless. Ultimately your Altar should be pleasing to you esthetically and will act as pleasant reminder of the intentions you have set in your life and on your spiritual path. Dayle Mcleod is a singer/actor/witch extraordinaire. Check out her music at www.babydaylemusic.com. Read more about her and her rituals for re-alignment here.